The stunning artistic details in these 31 vintage hand fans make these illustrations a delightful challenge for experienced colorists. Beautifully rendered by artist Marty Noble, the book also offers historical notes on each image, detailing country of origin, age, and more. Illustrations are printed on one side of the perforated pages for easy removal and display. You will fall in love with coloring again. 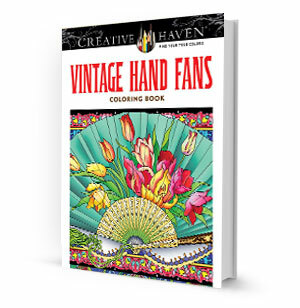 Includes 31 stunning artistic vintage hand fans to color. Many of the designs are based on the fans in the collection of Anna Checcoli. Also includes Commemorative fan, French folding fan, Japanese folding fan, and many more.